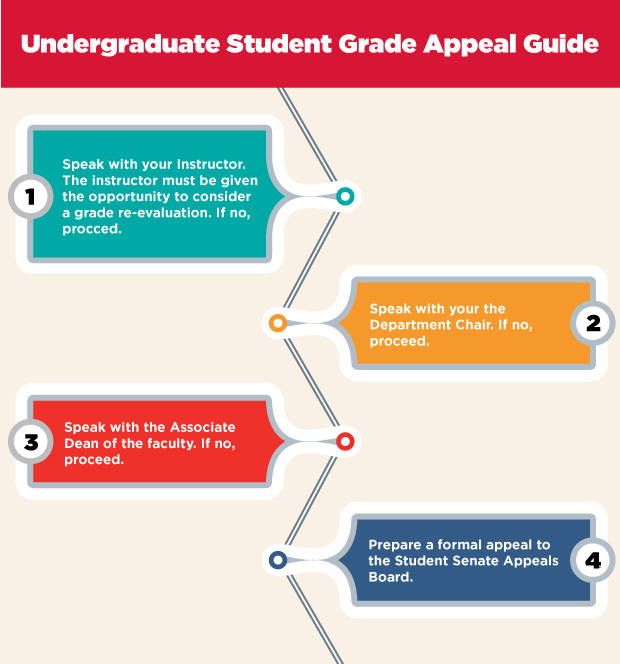 Undergraduate Grade Appeals are outlined in the Academic Calendar and in section 12 of the Faculty Handbook. You have 180 days from course closure, to file an appeal. You must follow the chain of command cited above: Instructor/Supervisor, GPD, Faculty Dean and Dean of Graduate Studies, SSAB. You cannot skip a step. Ask for all outcomes to be offered in writing (e.g., ask instructor to write down why he/she said no to the grade re-evaluation). Appeals are preventable by speaking with your instructor BEFORE these issues threaten your standing the course. Instructors are best equipped to accommodate your needs if they can prepare ahead of time, rather than retroactively. The Appeal Process takes time, energy and money. Budget 30-40 days of appeal time in your schedule to meet with your Instructor/Supervisor, GPD, Dean, Dean of Graduate Studies and SSAB. Appeals at the SSAB level cost $50 payable at the Registrar’s Office. This stage is informal. Best practise means setting up an in-person appointment with your instructor to discuss your grade and how it was evaluated. Email and phone aren’t as effective when trying to advocate for increased grades. You have the right to feedback on your work; so ask. The instructor has the right to evaluate the work with academic licence and freedom (e.g., some closely follow a rubric while others offer instruction with no rubric and others, evaluate from experience with little formal breakdown of how the grades are considered). Ask your instructor how they achieved the final grade on the work. Offer your instructor specific reasons why you feel you have been assessed unfairly (e.g., outline areas that you feel were graded harshly; point out areas in the rubric that may not have been abided by; present documentation that may explain poor grades. Do not wait until last minute to announce an inability to meet a deadline. Always communicate with your instructor about any issues you are having that can impede your success in the course. This increases the likelihood that they can and will help you. Leave your instructor with a hardcopy of your grade rebuttal in full detail. Give your instructor about 10 days to reconsider the grade. Inform the instructor that you are bringing your appeal to the Department Chair. Book an appointment in person with the Chair. Send the Chair a copy of your grade rebuttal and any communication between yourself and the instructor that will be helpful. Present your case to the Chair in the meeting. Give the Chair about 10 days to speak with your instructor and get a sense of what the issue is; to investigate your claims and prepare a response to you. The AD is the final decision maker for your appeal. Rehearse your points of defence for your grade. Prepare a document for the AD outline all of your concerns prior to your meeting with him/her. Act professional despite strong feelings or emotions. Do not express your personal anger towards the instructor. Do focus on the grounds for appeal. Offer an equitable alternative outcome. A third party to evaluate your work rather than the instructor. If the work cannot be resubmitted or rewritten, offer an alternative. If you are not satisfied with the ADs final decision, you are welcome to appeal within 30 days of the date stamped letter that he/she sends you via mail. 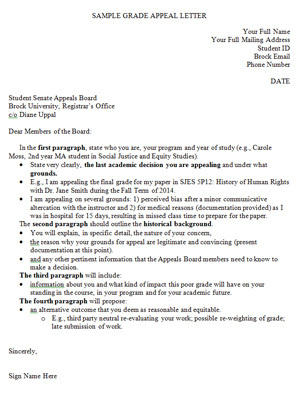 The final appeal would be addressed to the Student Senate Appeals Board.